Helps alleviate symptoms of diabetes. 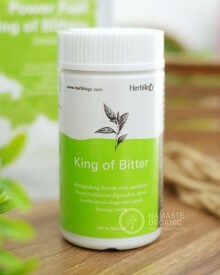 Only to be used by patients with formal diagnose from doctor. Each capsule contains 500mg Andrographis paniculata Extract (ekstrak daun sambiloto). Only for patients with formal diagnose of diabetes from doctor. Not for pregnant and nursing women.